@Blink. Well all Ellen’s special agent in charge & former Sheriff specialist Dave Kirby has to do is program blinkoncrime into his digital social media public fishing line of survelliance for plenty of comment about criminal public corruption in Oregon, or get a job over at the Federal DOJ and eavesdrop. Rosenblum needs fo take a lesson from Kathleen Kane who swept out plenty of special investigators and attorneys, tho they are getting even with tort suits and criminal jeopardy, but at least plenty are gone for good. It took a Sandusky. Maybe no one wants to find that associated with Skyline. Is the Yankee interview missing from the Gray-Loughary documents? missing from interviews: Marshman, her auditor, Ott, the apparently former Inspector being replaced by Moore, anyone present with Heilbrun, Gates, Reiser, Moore, Eliot. Still reading along. I’m always fascinated by what you all come up with. In regards to events and silent auctions the Portland Comminity is very generous. Our PTO just raised over $6000 based on donated items from our community. Out of curiosity I don’t think I’ve seen this mentioned but does Kiara get any court ordered counseling? I can only say that the opportunity is provided for in her parents stipulation agreement. Also out of curiosity (I think I may have asked before but forget) how closely has Kaine and his associates been investigated? Kaine would have known Terri the ild have his white truck how many of his friends drove a trucks similar to his? I would say that in my opinion Kaine et al has not undergone anywhere near the scrutiny TMH has. Happy Mother’s Day weekend Blink and Blinksters! The weather is just perfect here and though I am doing a juice cleanse (which means my special day will sadly not involve food)just having my children with me helping with yard work as their gift, will be perfect. I hope you all also have a wonderful weekend. Hi T. Ruth. Just want to give some insight into the story you linked. The author of that piece did not vet who Tyler’s mom is as can be seen in the comments on the piece so poor reporting there. Also, she has listed some other children in the area who have gone missing. Many, perhaps all, of those children are in the ‘system’ and frequently run. Most have already been found and likely ran again so here the author made a correlation that is unfounded. Again, poor reporting. That said, I do believe Tyler’s disappearance is suspicious and many people are very worried for him. 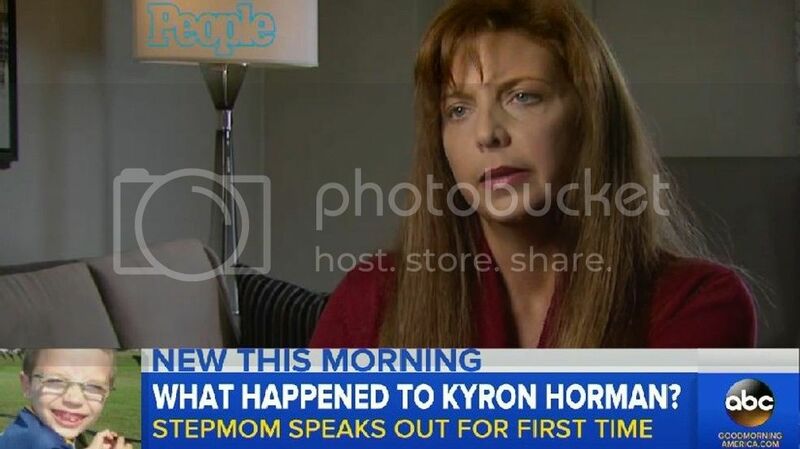 It’s been too long since little Kyron has disappeared. His sweet little person deserved so much better. I hope someday justice is served, for those of us who have prayed for him all these years, but mostly so that his little soul can be at rest. Happy Mom’s Day and glad to hear of your weather- something like our 10th day of rain here and no end in site- but my peas are in the pod this weekend so all is right with my world on that front. Echo your wishes and those for Kyron. It is up to Rod Underhill DA, who has professional investigators, to opine on the quality and satisfactory content and conclusions, or not, of Wm Gray’s (under Loughary & Kirk, & Acting M Slauson, & Ellen) rather than Kafoury to do so. Because its his area of expertise. But I get that Rod, Richard and his wife, are all likely paddling the same canoe as Ellen and Kate, and just grateful Kitz didn’t sink theirs. Any Mothers Day pasta NelMel? that’s because she was one and her child was wrested away by mcso and their collaborators, and because another not-new mother has been her persecutor in chief. I think for TMH to comment anywhere will send soldiers ballistic. I hope the BOC interview is being held for a higher timing purpose to her family’s benefit. According to this, Gray interviewed Yankee on April 6th. So would that mean that she is the confidential source? I write investigative reports for a living- such a deficient mess reflects on the “same old” there. Yankee, Ott, Lnstrand, Staton, & others should’ve been interviewed by subpoena under oath. Bet any OR grand jurors would’ve reached apt conclusions. gets a judge to explicitly order it, not merely provide the option. Terri, Wishing you Mother’s Peace Day, how this day was originally intended. Her best known credit was poem the Battle Hymn of the Republic. That first line of water or of tears, made me think of you. It was inspired by war, which we know you are in and the desire for peace which we hope you get. Godspeed to you. makes me question both her and Soldier’s maternal relationships. Is there something there behind all the anger? prime “witness” Ott, any fool criminal division attorney would want her under oath. from the Guisto transcript to the Ellen Files? IDK, but I took it as she was just making sure *the rest of us” got recognition. Not being fortunate enough to be a bio-mom, but being a stepmom and grandma-step of many, not to mention the favorite aunt and Godmother to more, I think I got where she was coming from. Sometimes the best mother figure in some child’s life is even an aunt, or a grandma. God Bless all of them who are there for the children. Happy Mother’s Day! So glad to see you again, Amys Sis. Happy Mother’s Day to you too. I hope Tyler is found soon, his case sounds ominous to me, not suicidal. This whole world is getting more scary each day. A garden is my bliss. Spent a lot of time out there today, lovely weather, although a little warmer in the afternoon than I would have liked. And we actually fired up the bbq this evening. About a month earlier than usual. Haven’t read all the docs yet, but it sounds to me like the Oregon DOJ is in need of the first overhaul. O/T and is probably posted on the Penn State threads, but did ya’ll see the news about some court filings alleging Paterno knowing about Sandusky abusing a child in the 70′s? Years and years. How many more victims are out there, or is it were? Thanks for the link to the investigation Rose. This is a big nothing burger. Taking someone’s word that they did not use a LE only tool is pure foolishness. Why not access the log-ins by the various people under investigation into the LEDS data base? There should be a complete list of who was on the system minute by minute of any day during the period along with a record of the files actually opened. If not, there is zero audit trail of the program and its use. It is almost Mothers Day again. Mothers are the most important parent in the creation of a family and its early nurture. Mothers are not limited to that of a bio parent and represent all who fit the role. Mrs. ATG received a dozen pale orange roses with dark almost red edges on the petals. A virtual dozen to all the moms on this site. Those are beautiful!! And thank you! the problem of this & probably other ODOJ criminal investigations is likely not the partisan or fair issue but a criminal law competency issue. ODOJ investigators are on the front lines from low level & rural local LE backgrounds, not even OSP, and lack basic training & educated supervision imo. looks like a good ol boys hiring network. supervisors should have law degrees. I appreciate her sentiments TRuth, and wish we could hear her interview, but trust Blink. and wish those who have stood between her and her children would get a conscience and step aside….Kaine, Rackner, Engel, Kantor, Bell, New Mommy, Underhill/Rees, and so on. best wishes to her parents. a roof over her chikdrens’ heads. why does he have 4 stars & 4 stripes? Desiree put some very nice garden pics up on her followers’ FB sites. kudos to mr & mrs ATG. the course of their for ANY purpose in the absence of suspicion of a crime is illegal in the State. Ellen R is the polar opposite of an aggressive State AG. legal theorist camp wrt governance. moore & staton look pretty bad. don’t see the stars & 4 stripes in 2015. @erose, thanks for the history lesson. Loved it. Just thought I’d share this with all our mothers out there today. Does anyone know if/how this Intel ‘strategic overhaul’ affects KH? Since when was it the responsibility of a State AG to make law? They are tasked with interpreting the law as well as doing investigations. I agree with Rose. All State AG investigators should have a law degree. They should also be taught about the various computer systems in use as information and aids to LE. This should include learning about the tracking tools generally available for audit. If audit tools are not available, the IT professionals should be called on to aid in getting information. This means one or two well trained experts in security and computer forensics. Having worked with several small county sheriff’s departments in Texas, I can say that most small departments do not have but one or two who have the education to do quality investigations. General patrol is their job which does not require a college degree. Arguably, under existing Oregon law, targeted google searches for personal information of a State-legislature -appointed County Charter review committee, a task mandated by law, by a Chief Deputy in a County Sheriff’s Dept, acting under a Sheriff’s order on the job as an employment duty, where there is no suspicion of any committee member commiting a crime, could easily be construed as a statutory violation. I do not recall the Statute specified an “LED” search only. Ellen chose not to make that charge and argument. Had she done so, case law about the statute would have advanced in OR, garden variety stuff, and the Legislature could let their illwritten Statute stand or rewrite it to guide in future similar circumstances. That would not be making law on Ellen’ AG’s part, but enforcing the Constitutional spirit of a poorly written Statute. The AG’s job is Statute enforcement; not Ellen’s forte apparently. @ATG Got a laugh. Staton’s auditors are gone with the wind over to other County jobs. here’s an analogy. Say a House Foreign Affairs Committee appoints a civilian ad hoc Benghazi investigatory committee whose sole work product is mandated by law to be policy recommendations for State, CIA, NSA, and their contractors as to how to reform their agencies–and take away Agency Director’s unilateral powers– to prevent future military-diplomatic imbroglios abroad. The former Sec of State, now the CIA head, must testify to the committee, and tasks her chief of staff to access any publically available internet site and prepare an informative dossier on each committee member. The hypothetical catch would be a Federal statute prohibits such intelligence gathering on US soil or without a reasonable suspicion of criminal activity. Then the CIA Director meets with committee members, waves her bio dossiers, and says I’ve done my work on you. Imo that is a threat. The problem appears to be the investigator oroduced a written report. Otherwise it coukd’ve been swept under the rug. Staton was an interim Sheriff until mid-May 2010. The abduction was like a kick-start to his command & control, took the Commissioners’ eyes off the jail OT for a few years, and garnered big bucks for mcso and its employees thru an undisputable good cause. Skipper had 4 stars and 4 stripes in 2009 retirement pic. Guess that’s the uniform. I truly feel for these professionals that are trying to do the job in which they were sworn. Should be interesting in the next few weeks. easy to see why Kaine “fell into line” and Terri and Spicher became Staton’s prosecution targets. Do KH and DY get the Trib? TKG, Read iThink’s comment. Seems to suggest the engineers are on their way out. o/t TRuth, The question of Paterno’s (and others) knowledge of Sandusky’s crimes was subject for lots of fodder on Blink’s Sandusky threads. There was a man who claimed he had once been traded around at Penn State by the likes of Eddie Savitz. After reading another one of his accounts, he said something to the effect that this rings of pedophiles would straighten up when Paterno was in the room. Whether that means Paterno never knew, or knew and didn’t approve is the question. Seems now there is a victim from the ’70′s and Paterno knew, not hard to believe, but I hope the alleged victim is properly vetted as these cash payouts are incentives to fabricate. Then there is the question of Ray Gricar’s disappearance having something to do with the case against Sandusky that he did not prosecute. Bottomline, IMO, did Sandusky fool all of the people all of the time? Hard to believe he did. Thank you Rose for the kudos. When you get to be our age, every day of life is a gift. Mrs. ATG loves roses. I have been giving them to her at Mothers Day, birthdays and at other important times for many,many years. I try to buy something different each time. Thanks for the link to the Portland Tribune article about the no-confidence vote. This may be the beginning of the end for the Sheriff. The next thing is for the voters to get busy and find someone to replace him that has proper training and leadership skills. After the sheriff, they need to examine the courts and those sitting on the bench along with the County District Attorneys. “We the People” have been lax in giving the proper attention to our legislative and judicial systems at every level for the last forty or fifty years. The American people are a patient people regarding government. We would much prefer that our government people be true to their duties and not attempt to attack the people. The time has come for all of us to get back in the business of watching for bad choices and behaviors and then doing something to make corrections. and BOC has many flashlights, held high. Holy crapola, how much more could one throw at him without him stepping down? Foolish if he does not. There are some extremely damning words coming from this union. It also leads me to believe that there is someone quite high-up in his department who is talking and very, very unhappy with the status-quo. Sheriff Staton leads *ruthlessly and unpredictably through fear and favoritism, threatening to fire those in his way, yet rewarding those who get in line*. He has fostered an environment of hostility, where those who constructively criticize his actions are met with retaliation, threats, and name-calling. His reckless leadership style has resulted in *hundreds of thousands of dollars in wasted taxpayer monies paid to remedy his recklessness; funds which instead could have been spent to protect our community*. Sheriff Staton has lost sight of our community’s demands for transparency and accountability. We no longer have confidence in his ability to lead our agency. My goodness, Dan, step down already. If he does not, is the next move a recall, since he is an elected official? If so, I’m pretty sure someone has started the paperwork. LOL, the “green” curtain, MCSO-Green no doubt. Still looking for the one who wears the ruby slippers. Me, I hope they’re on Kyron. with an impregnable proportionality allocation. Meaning vetting claims’ legitimacies comes in number 3, or maybe 20.